Christmas is filled with the joy of family gatherings to celebrate while enjoying various food. Like humans, the Yaki (Macaca nigra) live in social groups and need their family and friends to survive. The Yaki is a special monkey as they only live in North Sulawesi and nowhere else in the world! The Yaki plays an important role in people’s lives. Why? The Yaki eat up to 145 different species of fruit and plants and spread these seeds widely throughout the forests which allows new trees to grow. The Yaki keep the forests healthy and the forests keep humans healthy by providing fresh water, oxygen, food and other natural resources. The forest also protects the people against natural disasters such as floods and landslides. Unfortunately the Yaki experienced a population decline of more than 80% in the last 40 years and therefore have been given the status of Critically Endangered by the IUCN (International Union for Conservation of Nature). The major threats to the Yaki population are hunting and habitat loss. As the human population grows, people need more space to build their homes and land to grow food. When cutting trees to create more space for people, the homes of the Yaki (the forests) become smaller and smaller. The Yaki cannot find enough food in the forests anymore and therefore come to the farmers’ land to fill their empty stomachs. The Yaki is protected by national law. UU No. 5 Tahun 1990 states that it is forbidden to capture, keep, hunt, sell, and transport Yaki (Macaca nigra), which applies to the skin or body, in part of whole, live or dead. The penalty for breaking this law is 5 years of imprisonment and a fine of 100 Million Rupiah. Part of the reason why the Yaki has the Critically Endangered status is lack of effective law enforcement. People hunt and trade endangered wildlife with almost no consequences – at least up to now. We hope this will change and work closely together with the authorities to protect the remaining Yaki in the wild. We will finish this Christmas consideration with asking you one more question: If there are more than 1 million Minahasan people in North Sulawesi and there are 5.000 Yaki left in the wild – how many Minahasan families can eat Yaki this Christmas before the species is extinct? How can you help? 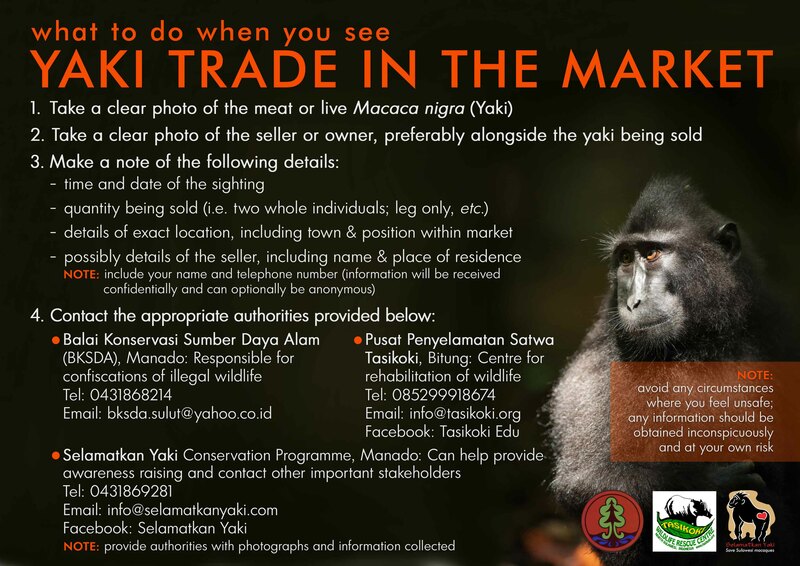 Spread the word to friends and family about the Yaki and our plight to protect them! Politely refuse dishes with meat from endangered animals such as the Yaki. Send us a message on Facebook or email info@selamatkanyaki.com and we will send you our Yaki Information Banner that you can print and spread around your village! Help us spread the message about the importance of wildlife such as the Yaki, for a better future for the people of North Sulawesi and a life in harmony alongside Minahasa’s unique wildlife! This article was written by Thirza Loffeld, Education and Advocacy Coordinator at Selamatkan Yaki. 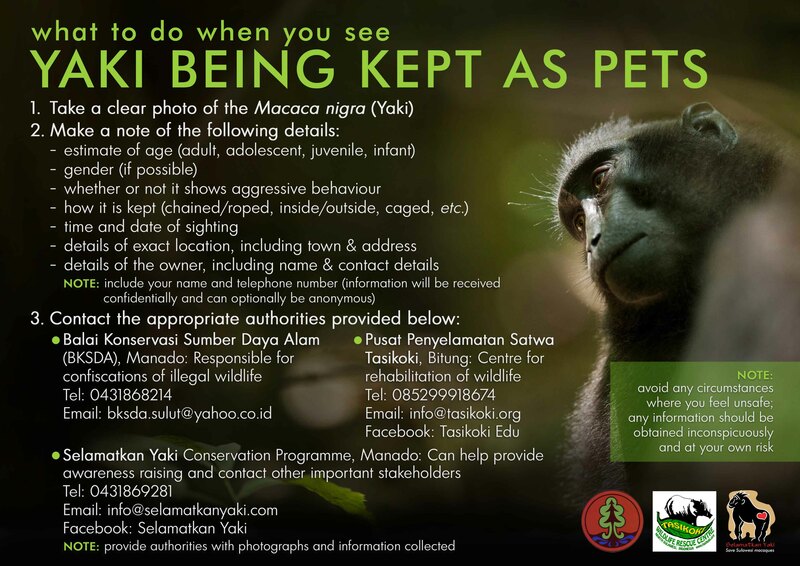 Selamatkan Yaki is a conservation program that aims to protect the remaining population of Yaki (Macaca nigra) in the wild.